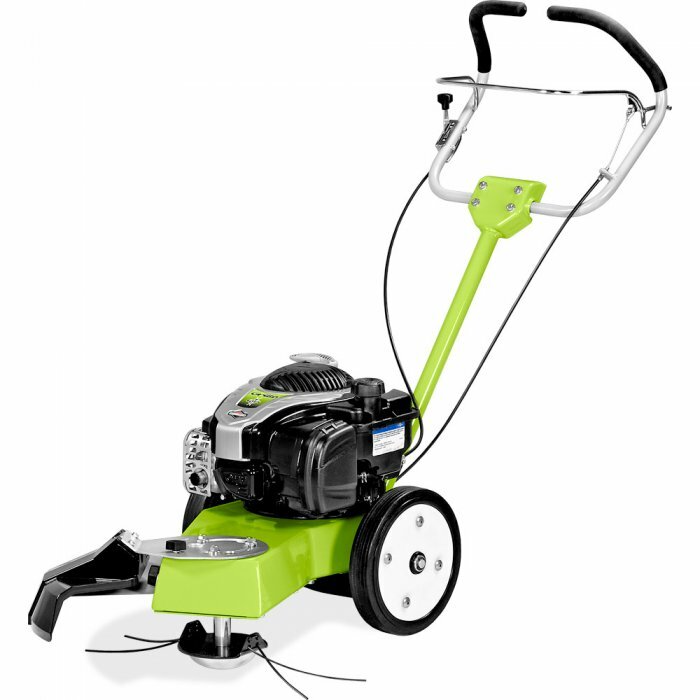 The wheeled trimmer with a 140cc engine. 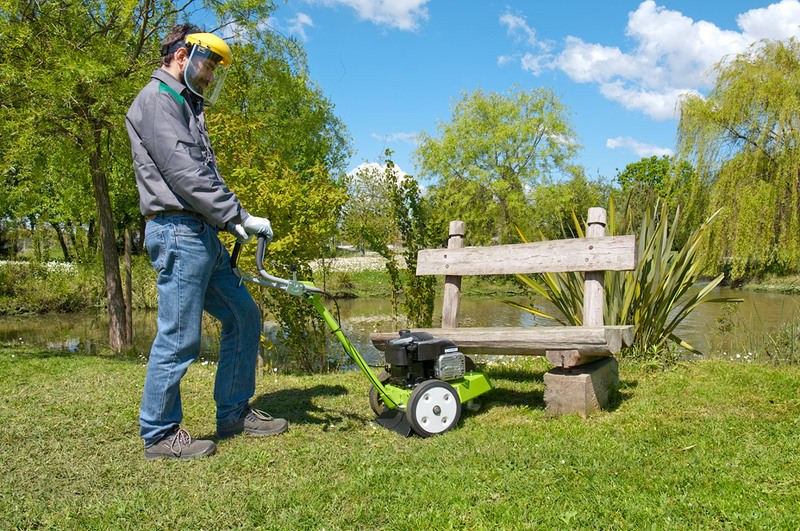 The Grillo X-Trimmer is a wheeled trimmer which is ideal for cutting grass in rural areas and to carry out finishing work around trees and other obstacles etc. 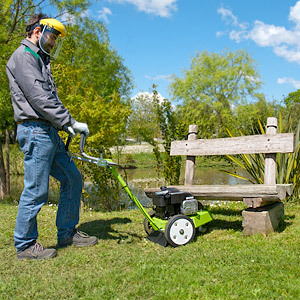 It can be used as a mower for small and even ground areas. 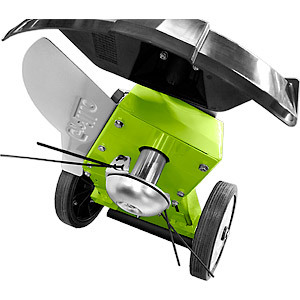 It is very compact and maneuverable, light and has an innovative design. 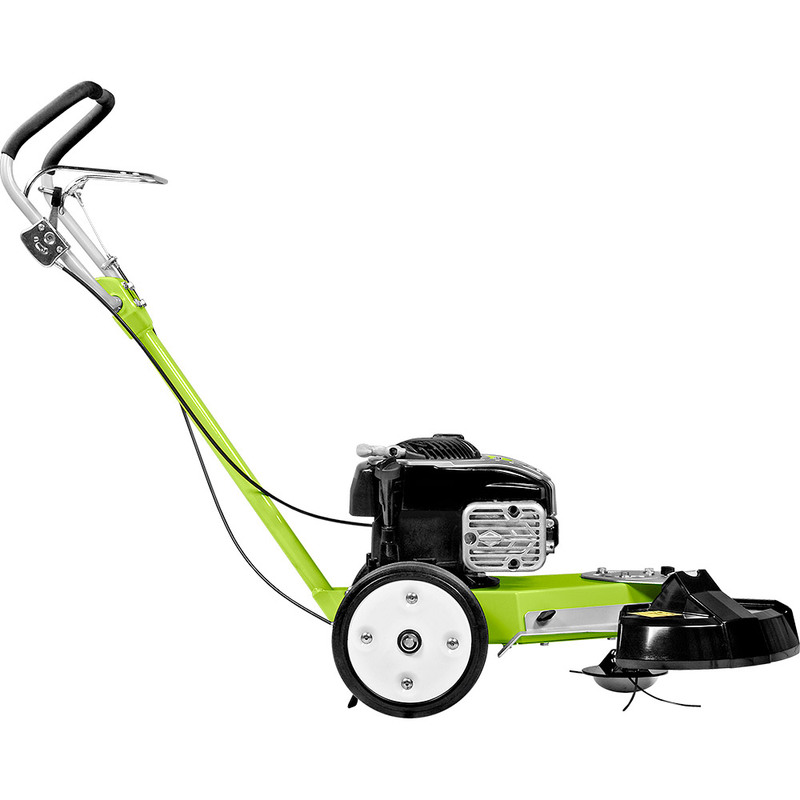 The main feature of the Grillo X Trimmer is the left- inclined body which allows the nylon cord to cut beyond the left wheel area. You can comfortably follow a straight trajectory, and cut with precision near posts, walls or fences. 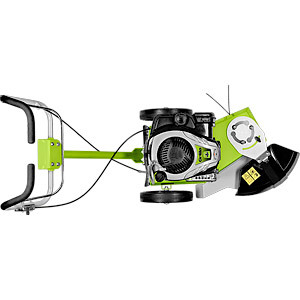 In order to allow a higher degree of safety, the clockwise rotation of the cutting head throws the grass in the opposite direction to that of the operator. Cutting width is 450 mm and allows you to reach even the most difficult areas and achieve a perfect finish. Cutting heights are 45 and 57 mm. The square section cutting line is long-lasting and ensures high performance. Its replacement is quick: just lean the handlebar on the ground and the cutting system is easy to access. 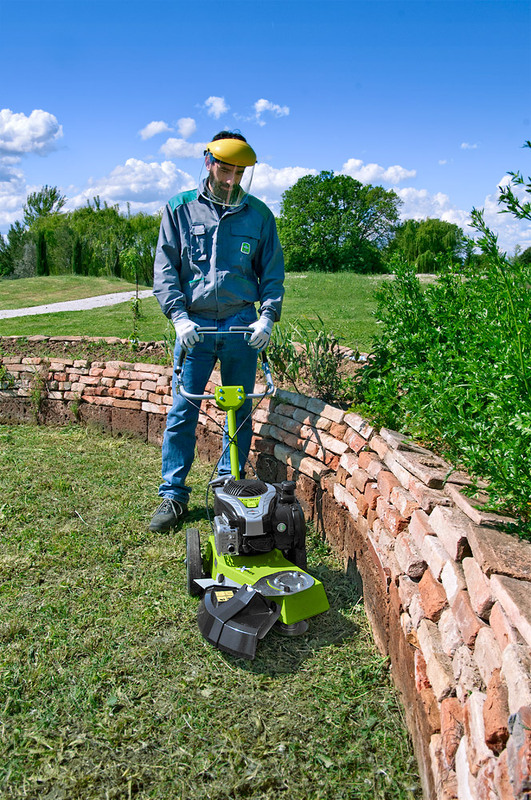 The Grillo X Trimmer has a new fixed cutting head: it does not rotate together with the cord holder plate but is fixed: in this way, we prevent the cutting head from wearing, due to long working on asphalt or sandy areas. The head is mounted on quality bearings thus ensuring its reliability and long life. 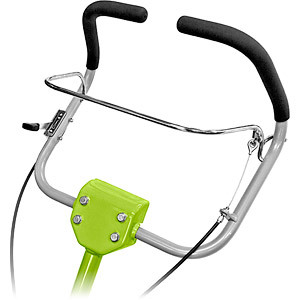 The adjustable handlebar adapts to any operator. Soft rubber handlebar grips make work even more comfortable. The lever to engage the cutting head rotation is easy-to-operate and gradual. The transmission belt between the engine and cutting system is made of kevlar, very hard wearing and reliable. 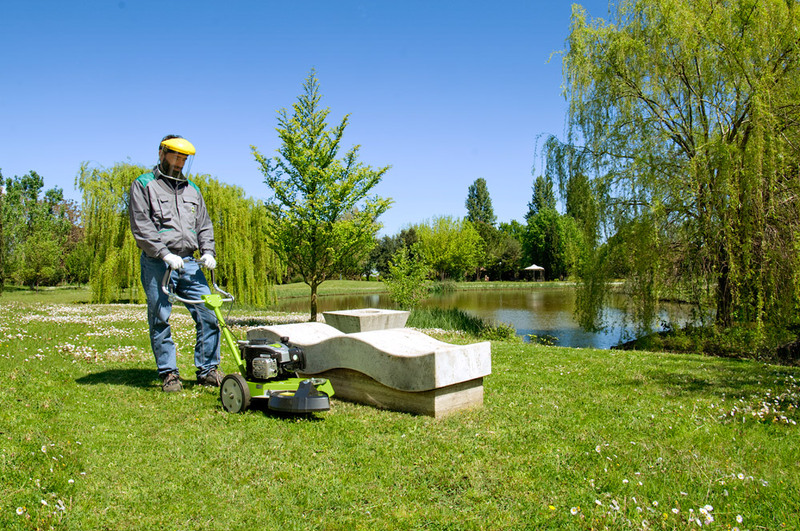 The wheels which are mounted on ball bearings, and the perfect balance of the machine allows you to transport it with minimal effort as well as use it on uneven ground. The machine is fitted with a petrol Briggs & Stratton 575EX OHV engine. The fuel tank capacity is 0,8 L. The engine has a 140cc displacement and incorporates the latest technical innovations such as overhead valves, ensuring reliability, low emissions, reduced consumption, high performance and the vibration is reduced to the minimum. The engine, equipped with Ready Start System, is very easy to start. 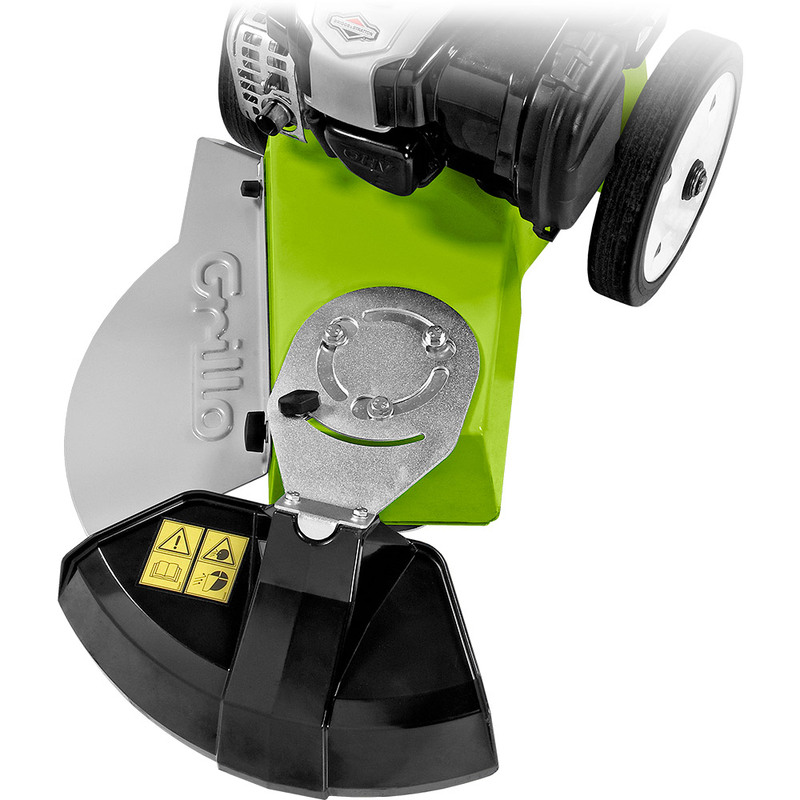 The Grillo X Trimmer has 2 separate protections on the machines frame. 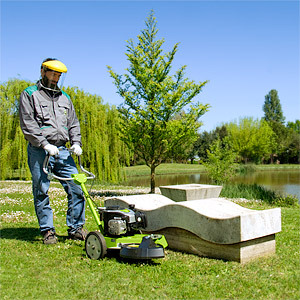 The first one can be side-adjusted to direct the cut grass; the second one, made of steel, prevents grass or other potentially dangerous objects from being thrown towards the operator. To complete the safety equipment, protection glasses and suitable work clothes must always be worn by the operator. 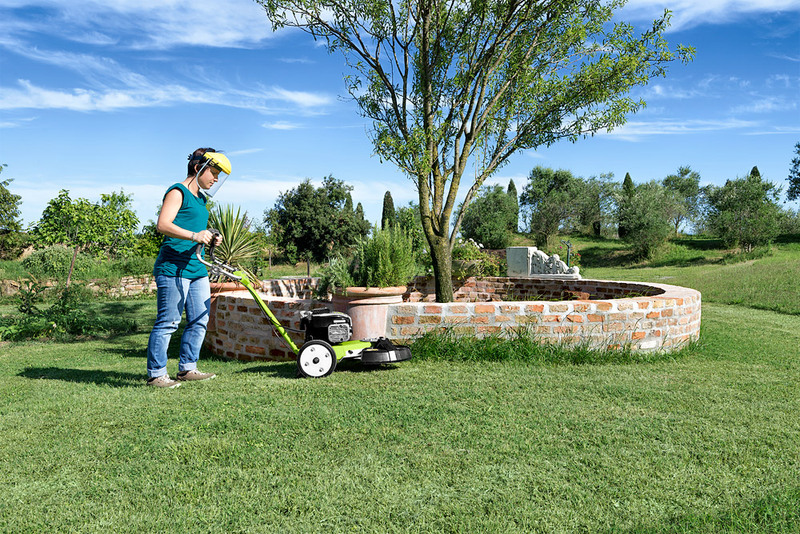 The Grillo X Trimmer does not need any special service except routine engine maintenance. Before each use, it is enough to make sure the paper air filter is clean. 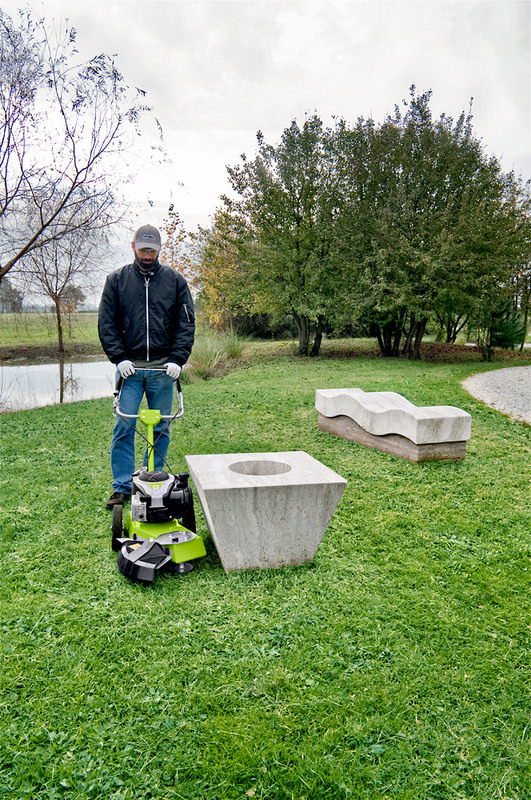 The machine can be easily put into a vertical position by leaning the handlebars on the ground: cleaning operation will be therefore very easy. All components, from the simplest to the most complex, are of a high quality standard. Chassis, transmission, cutting system, everything is built by Grillo in Italy by using only premium materials and cutting edge technology. All this to achieve a constant and 100% controlled high level quality. Varnishing of Grillo machines consists of a double electrostatic powder coated process. At the first stage are the washing baths and the preparation, then a first protective coat is applied which, together with the baking in the oven, turns out to be the best base for the application of the finish. The second coat consisting of powder coating and further baking in the oven at 190°C, this then gives the characteristic hardness and brilliance. Grillo X Trimmer has been mounted with care in every detail and tested scrupulously by specialized personnel. Final inspection means a machine whose engine has been run in order to check its performance. 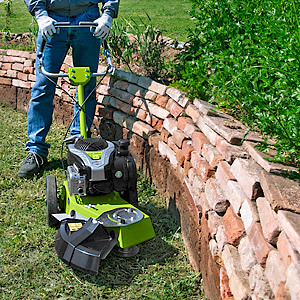 Grillo X Trimmer , as with all Grillo products, is designed and built to last and retain their value over many years. All Grillo products are distributed and serviced by a widespread Grillo specialised dealer net. Spare parts remain available also after a lot of years.